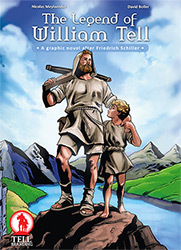 This graphic novel tells the story of the marksman William Tell and his fight against the tyrant bailiff Gessler and the premise of the Swiss struggle for independence from the Habsburg Empire in the early 14th century. Directly adapted from Schiller’s famous play and beautifully drawn, this graphic novel offers the perfect reading experience for all ages. This new adaptation of “The Legend of William Tell” is a modern and easily accessible graphic novel that will rekindle the myth for new readers. With a personalized sketch by David Boller! AGB: All articles are usually shipped within 2-3 days. Our partner in the EU is PPM Medienvertrieb, Dörentrup, Germany, Please read our full AGB (conditions of sale) and our Widerrufserklärung (return policy).